Don't miss the ultimate event for 2D and 3D artists. 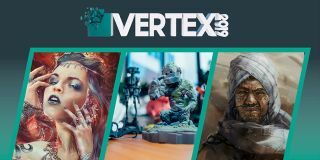 Among Vertex 2019's already impressive lineup is ILM visual effects supervisor Alex Wuttke, who will be sharing rare insights into the design of Jurassic World: Fallen Kingdom. Joining him on the main stage will be Framestore's Andy Kind, who will take audiences through some of the almost 500 visual effects shots the studio created for J.K.Rowling’s Fantastic Beasts: The Crimes of Grindelwald. On top of that, you'll get hands-on advice and tips, hear about the newest developments at engaging masterclasses and workshops, get feedback at portfolio review sessions and mingle with some of the brightest minds in the creative industry. There’s even a recruitment fair for aspiring and professional artists and an expo area to showcase the latest in technology and software. What’s more, there will be an ‘Ask an Artist’ area to help you troubleshoot your technique woes one-on-one with pro artists, and don't forget to leave your mark on the new dedicated doodle walls.